A hospital stay can be stressful and worrisome for children of all ages and their families. The child life department at CHOC Children’s is dedicated to helping make hospital visits easier for the entire family by “normalizing” the hospital environment and creating ways for children to continue growing and developing through bedside and play room activities. Play rooms throughout the hospital are open daily. They are staffed by volunteers who are always willing to provide a helping hand with toys, activities and crafts. Each play room has a variety of activities for all age groups ranging from arts and crafts and infant and toddler toys to video games and board games for older children. Siblings of patients are encouraged to use the play room along with the patient; however, siblings younger than age 11 must be with an adult while in the play room. Unfortunately, due to infection control protocols, patients and family members in isolation are not allowed in the play room but can be provided appropriate bedside activities upon request. To ensure all our patients’ safety and isolation protocols, everyone entering the play room will be checked in by a volunteer and asked to wash their hands with alcohol gel. 10 a.m. – noon, 2 – 4 p.m., 6 – 8 p.m.
10 a.m. – noon p.m., 2 – 4 p.m. Please remember patients and families in isolation are not allowed in the playroom. Pet therapy is a volunteer service that puts countless smiles on the faces of our patients and families. Our pet therapy program consists of dozens of dogs who visit the Tidwell Procedure Center, Clinics, Cancer Clinic, Outpatient Infusion Center and the Emergency Department. Each dog is escorted throughout the hospital by its handler (owner) and plays an important role in the treatment of our patients. Minimize the stress and anxiety of hospitalization and illness. Provide warmth, comfort and sense of familiarity. Offer play and “normal-life” experiences. Provide a distraction from pain, medical treatments and daily routines of hospital. Encourage patients to complete treatment goals like walking. Encourage conversation, interaction and communication. Pet therapy teams must be registered with Pet Partners prior to applying for the CHOC Pet Therapy Program. This national organization will register the team once they have passed an obedience test. If a pet handler is interested in joining the CHOC Pet Therapy Program, a team application must be submitted, followed by an interview conducted with the volunteer services department. Upon acceptance into the CHOC program, the pet owner must complete all of the necessary volunteer requirements, such as orientation classes and passing a medical test and background check. Dogs must be at least 1 year old and handlers must have the ability to take leadership roles. CHOC is looking for teams to be outgoing and friendly, have some experience working with children and have a professional presentation. For more information on Pet Partners, please visit its website at www.petpartners.org. A hospital stay can be stressful for patients and their families. The child life department at CHOC Children’s is dedicated to helping “normalize” hospital stays with many different programs and activities for patients, like our music therapy program. 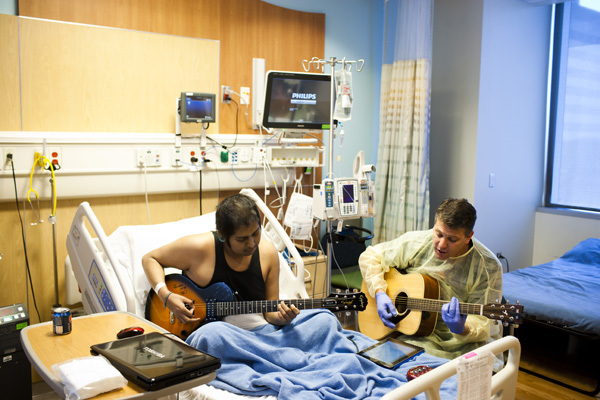 Music therapy is an established health care profession that uses music to address physical, emotional, cognitive and social needs of the patients. Hospitalization can be a traumatic experience for many pediatric patients and families. The child life department at CHOC Children’s is dedicated to helping to normalize the hospital environment and enhance development during hospitalization through a variety of avenues. One such avenue is the volunteer art program which strives to promote positive coping and emotional expression through art. Our art program provides patients an opportunity to engage in a variety of art mediums with a specially trained volunteer. Finger painting, scrapbooking and taking photos might seem like it is only fun, but it also helps children express themselves, provides avenues for developmental growth and mastery as well decreases stress and anxiety. 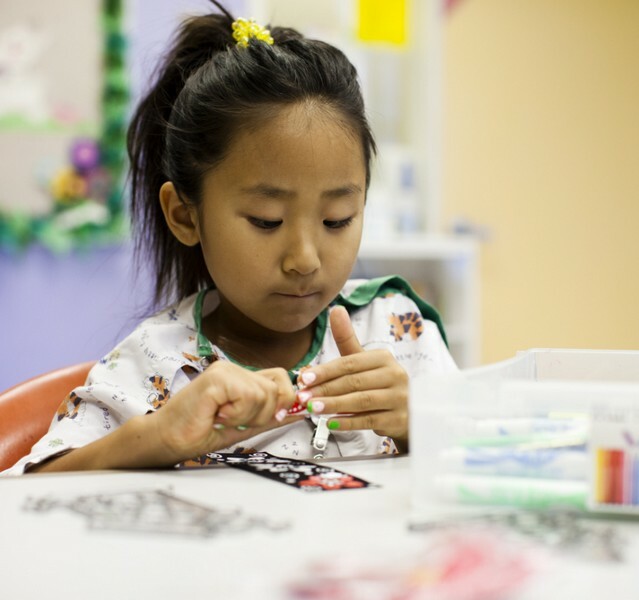 Our volunteers work to inspire creativity, develop self-esteem and give our patients a break from feeling sick.